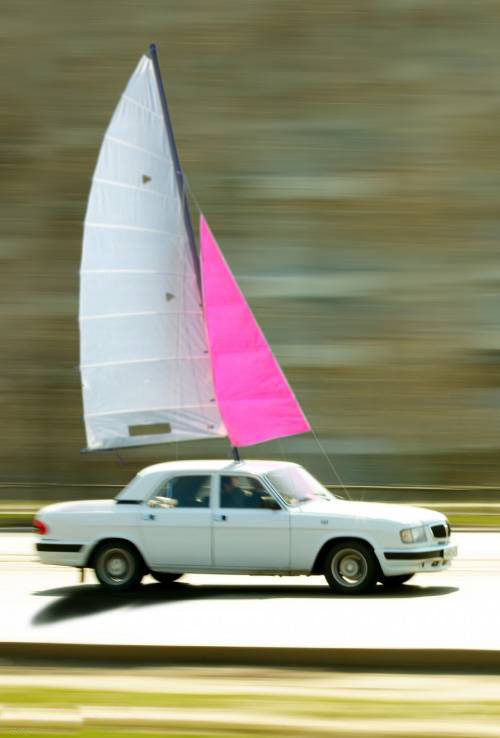 The internal combustion engine jumps the shark, or to put it into terms from another transportation field, it enters the "More Sails" phase. The first successful steam-powered vessels were built for use on canals and rivers in the early 1800s. Not long after, there were ocean-going hybrid ships with sails and steam. The steam engine didn't have to wait for the wind, could sail in any weather, and didn't have to jibe and tack. With these ships, new trans-Atlantic crossing record times were being set and more ships began incorporating steam engines. Not all ship makers embraced the new technology. Some responded to the threat by doubling down on the legacy that they knew and loved. To compete with the record-setting times, they added more sails. This is when sails jumped the shark. The effort prolonged the demise, but did not prevent it. 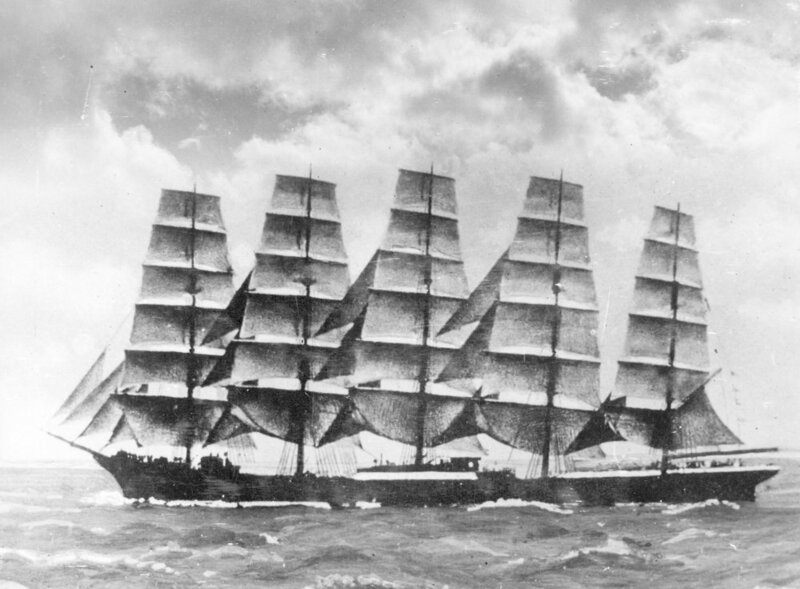 During the late 1800s, large sailing ships almost completely disappeared as steam power took over. The bulk of the transition occurred during just one century. Much like the ships that added more sails, there are automakers today turning the ICE engineering to eleven in an attempt to prolong its life. In late 2017 Mazda announced a 'Holy Grail' breakthrough in engine tech with their Skyactiv-G high-compression gasoline engine. Similarly, Toyota made claims in February of this year that they had created the world's most thermally efficient 2.0-liter gas engine. They are not the only ones, despite dieselgate (more on that below), just weeks ago, Volkswagen's leader announced a "Diesel Renaissance" is on the horizon and Nissan has been talking about HCCI as the next great thing in engines since 2013. Occasionally, you'll see a story about rotary engines posed to take over... These are all signs of "more sails". Engines are a mature technology. It's highly unlikely that there will be a breakthrough that greatly changes their fuel economy. 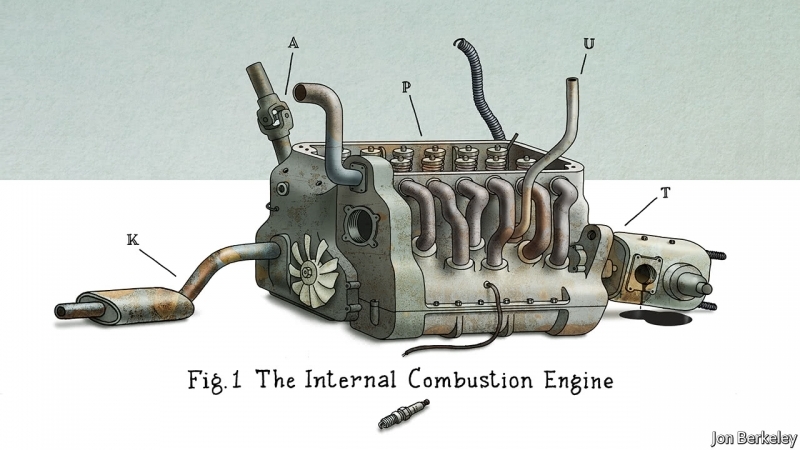 Internal combustion engine tech is over 100 years old and it has had a lot of R&D sunk into it. There are fundamental limitations to combustion. The headlines often say something like "New Engine 30% More Efficient" but this is very misleading. First, the results that you get in the ideal conditions of the lab are, just that, ideal (in a warmed up engine at optimal RPM...). In the real-world, this will be reduced, but for the sake of argument, let's assume they really have a 30% improvement. Gasoline engines are about 20% efficient. So a 30% improvement would mean 50% efficiency, right? Wrong. That headline means 30% better than 20%. This is what I call "marketing math". If you were at a restaurant and the bill was $20 and you left a generous 30% tip, that would be $6. Appling this to engines, you could call a 26% efficient engine 30% better than an engine that is 20% efficient. A headline that reads "6% improvement" does not get as many clicks as "30% improvement". If they are comparing the improvement to a lower efficiency starting point, marketing math can make the improvement percentage even higher. Even in the unlikely event that an engine with a 50% thermal efficiency were to be created, it still would not compete with the 80 to 95% efficiency of its new rival, the electric motor. Even an efficient gasoline engine is still burning gasoline and emitting pollutants into the air where we live and breathe. The original 1908 Ford Model T had a fuel efficiency of 21 MPG. Not including hybrids, the average fuel efficiency of the gasoline-powered cars on the road today is not much better than the original Model T. More than 100 years later there was no big breakthrough that allowed 200+ miles per gallon. Emissions cheating is yet another symptom of the engine apostles clinging to the old technology and pushing it beyond its capabilities. Either the emissions requirements could be met, or the performance requirements, but not both. The majority of this press coverage focused on Diesel, but some gasoline engines were found to be using defeat devices as well. As a society, we no longer want the health impacts or the environmental impacts that fossil fuel engines cause. Emission standards increased to reduce these impacts, but engine technology is just not capable of being something other than what it is, a combustion machine. Just as the earliest Atlantic crossing ships to use steam engines were hybrids, some of the cars available today are a mix of traditional internal combustion and electric motors. The Toyota Prius was a landmark hybrid car. It nearly doubled the fuel economy of other cars at the time of its US introduction. Today, there are plug-in hybrids from many automakers. You can plug them into a standard outlet in your garage overnight and the next day the battery will be full. This allows you to drive some limited number of miles on electricity. Then when the battery is drained, it just uses gas from the tank and you never have to worry about mid-day charging. Driving a plug-in hybrid allows you to enjoy many of the benefits of an all-electric vehicle without ever worrying about where you could plug-in. If you are not already driving all-electric or not ready to jump in with both feet, I would recommend that you get a plug-in hybrid as your next vehicle. Depending on the electric range, you could cut your gasoline usage in half. You'd get to experience the smooth quiet acceleration of an electric motor and still have the safety net of using gasoline when you need it. The introduction of the steam engine to ships has many parallels to the electric motor's entry into cars. Just as the first steamships were used on canals and rivers, many of the early electric cars of this generation were urban runabout or commuter cars with less than 100 miles of range. This class of electric car filled these niches very well, but they were not a general purpose vehicle. Just as the first steam engines to cross the Atlantic did so as part of a hybrid vehicle design, the first "transcontinental" vehicles to utilize electric motors were hybrid cars. It took nearly 100 years for the engine to fully replace sails. However, just as everything else happens faster in our modern era, transitions are speeded up too. Today the Chevy Bolt EV and the Tesla Model 3 are for sale. These are just the first of many long-range affordable electric cars that will be coming to market. Over the next decade, things will change radically. ICE has jumped the shark. It is not dead yet, but the writing is on the wall. Don't let it take you, your career, or your business down with it. I'm not sure if engines will be history by 2030, 2050, or 2070, but this is the century of their demise. It's time to consider electric cars rather than putting more sails on your internal combustion vehicle. If you have solar panels or you are considering them, congratulations you are helping make the world a cleaner place. After deciding to jump in, there are a few questions that you'll need to consider. One of those questions is "Grid-tied or Off-grid?". In some cases, such as a cabin in the woods, connecting to the grid is not an option. Assuming that you're already on the grid, then you do have a choice whether or not you'll stay on-grid or go off-grid. A friend of mine has an off-grid system and he made the claim that it was "greener" than my on-grid system. I wanted to examine this claim (heavily biased towards proving him wrong). The particulars of his system and mine are not that important; I'll try to focus on the bigger picture. For a grid-tied system, you can install a PV system that accounts for only a portion of your energy needs. 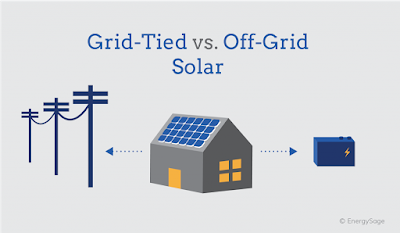 Any energy needs your home has when the sun is not shining will be provided by the grid. How green your local grid is, depends on where you live, but most of them are slowly improving. Many utilities have a green power option that supports their solar, wind, or geothermal projects. For off-grid systems, the solar panels and batteries have to supply 100% of your energy needs unless you have a backup such as a generator. Backup generators are usually diesel or natural gas based. If these were being used, then an off-grid system would be less green than a grid-tied system. To remove this drawback, let's assume that each of these systems are capable of powering your home 100%. Which is greener? A minor advantage for grid-tied here since the backup could be cleaner. With a grid-tied system, during the day surplus energy is feed into the grid and runs your meter backward. This energy is then used by nearby demands (AKA, your neighbors). After the sun has set, a grid-tied system draws energy from the grid, unwinding some of the backspin from the meter. With an off-grid system, when there is surplus generation, this is used to charge the batteries. The energy from the batteries is then used to power your home overnight. There is some minor loss of energy during the store and retrieve process. Which is greener? A minor advantage for grid-tied here because it does not have the storage loss. I live near the 47th parallel. We have a winter season here. We don't get a lot of snow, but there are many cloudy rainy days in the winter that don't generate much energy. On these days, even with a very large PV system, we would not be able to generate enough energy for our needs. With an off-grid system, we'd be running generators on these days. With a grid-tied system, we are able to use those summertime credits in the winter. Our state requires utilities to support annual net metering. This metering starts each year on April 1st. When the meter runs backward in the summer, you have all winter to use these stored kilowatt-hours. Additionally, there is less demand on the grid in the winter (air conditioners are not running) and the utility's wind turbines in the Columbia Gorge spin frantically during the winter months. Which is greener? Again a minor advantage for grid-tied here. An off-grid system requires batteries. These batteries have to be manufactured and transported. There are some environmental impacts for these activities. It is far less than connecting to a coal-plant, so it is worth it if you need them for a viable PV system. If you don't need the batteries, because you are connected to the grid, you can avoid these (albeit minor) impacts and you can avoid the cost. You can used the saving to buy a larger PV system. Solar is great whether you are on-grid or off-grid, you are generating renewable energy from the sun. There are reasons such as grid availability or reliability that you might consider including batteries in your PV system. However, if your reason to include batteries is that you think that makes it greener, then I disagree. You could even say that you want to have a Tesla Powerwall because you think they're cool, that's great. Feel free to get one (or two, or three). But don't claim that it somehow makes your PV system even greener. As I said at the start, I might be biased since we don't have batteries in our system, but in every metric I've looked here, grid-tied systems have a slight advantage. The energy that they generate is always used immediately. The summer to winter delta is covered by net metering. And finally, on the cloudy days that don't supply enough solar energy, no generators need to be fired up. While both systems are "green", grid-tied systems have a slightly darker tint of green. All that said, we might just add a Powerwall or two just for the fun tech of it. How cool would it be to have the only house on the block with power during the next winter storm. One of the reasons that we bought a Model X rather than a Model S was so that we could tow our camper. Spring is coming and we'll be getting the camper out soon to prep it for our summer fun. In addition to pulling the camper, the tow package has other advantages too. We can mount the bike rack there and we can rent a trailer if we need to move large items or hardscape. I had been driving a Honda Passport to pull the camper. I traded it in for the Model X. 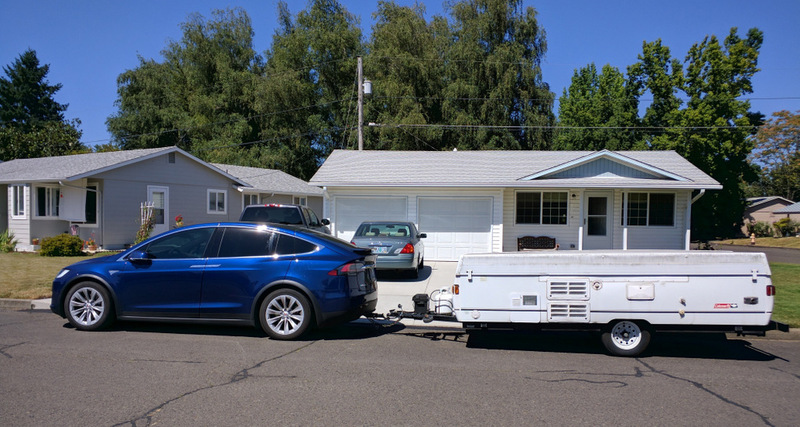 There were a few things I had to learn when we switched to towing with the Model X. The optional tow package comes with a proprietary hitch receiver. I suggest installing the receiver and hitch before you need it so you can take your time and learn how to do it. The unit has a twist lock system that installs vertically, this is different than any that I've used previously. Here's a video that explains the twist lock system. Once you figure out how it works, it's nice, but here is a small learning curve. At the rear of the car, there's a cover underneath that removes to expose the dock for the hitch receiver. This dock is attached to the frame. This is where you insert the hitch receiver. Once it is installed, you have to lock it into the dock. 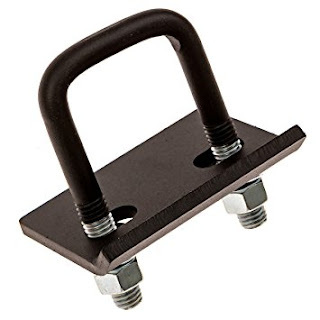 Ball Mount - This is the bar that goes into the Hitch Receiver; sometimes called ball mount shank or hitch bar. Sold separately. 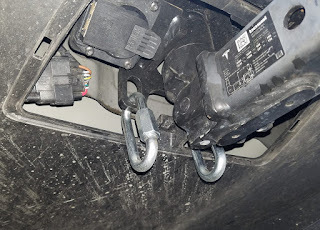 Hitch ball - This is what the trailer attaches to. Sold separately. 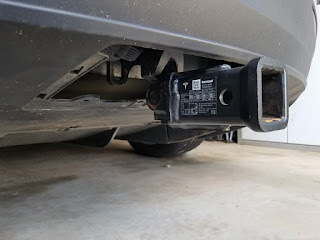 The Tesla Hitch Receiver (US) installed in the dock, ready to accept a 2" ball mount/hitch bar. In the US, there are three common sizes of trailer hitch balls, 1 7/8", 2", and 2 5/16". The 2" ball is the most common for light trailers and the size we used with our Model X. In addition to the ball, you will need a mount which fits in the 2" receiver which holds the ball at the correct height for the trailer to be level, and pins to secure the mount. You can buy the ball mount and ball separately and assemble them, or you can buy a kit like this one that comes preassembled with both of them plus the pull pin and cotter pin. I recommend a kit. Unfortunately, it is not as simple as just installing the ball mount. The bumper of the Model X is lower than it is on most trucks, so to put the ball at the right height, you have to flip the ball mount over and remount the ball such that it is raised, rather than dropped. To get the ball loose from the receiver and to remount it, you are going to need a really big wrench. 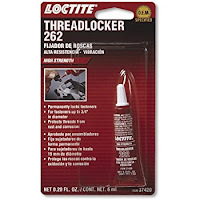 After you have the ball mounted in the raised position, I suggest that you lock the threads with Loctite Red or a similar product. This will be rattling around for miles and miles, a little loctite is a good idea. Now that you have the receiver installed and the ball at the right height. It's time to look at the electrical connection. The Model X only has one type of trailer electrical hookup, the 7-way round electrical connection. If your camper or trailer uses the same type, you're ready to go. 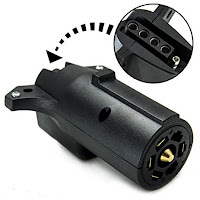 If, however, your trailer uses a 4-pin electrical connector, then you'll need an adapter like this one. 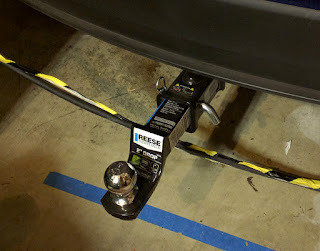 To avoid sliding under the car every time I wanted to connect or disconnect the safety chains, I installed a pair of safety chain extensions. 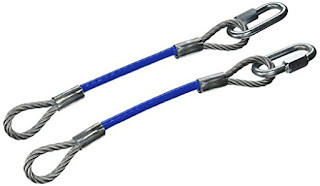 These are rated for 8000 lbs, while the X is only rated for 5000 lbs, so I feel safe using them and it makes the connect/disconnect process much easier. That's it for the basics. You are ready to hook up and roll. For the pro-towers, here's one bonus tip. If you expect to tow for more than 1000 miles each year, I'd consider adding a Hitch Tightener like this one. It will stabilize the ball mount and stop it from wobbling in the receiver. This will make it smoother, quieter, and reduce wear. Live the adventure! Special thanks to the Tesla Towing Facebook page. I learned much of this from them.